Bumper sticker printing will never go out of style. Bumpers are one of the most used spaces for stating what you stand for. 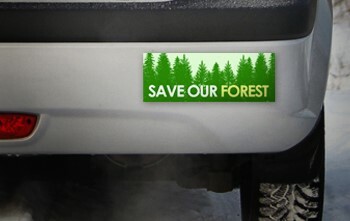 From political views to social causes, vinyl bumper stickers are a popular way to show support for anything. Custom bumper stickers have been used for everything, including supporting honor roll students, civic organizations, bands, and sports teams. However, they also have the potential to be a viable marketing space. Your business information printed on one can reach a wider audience. When you print bumper stickers, the only limit is the distance you choose to travel. Reach a whole new group of consumers by placing these stickers on your car, delivery trucks, store windows, or any other smooth, hard surface. Here at NextDayFlyers, we use top-quality vinyl material that is weather-resistant. The strong adhesive backing is perfect for vehicle movement and changing weather conditions. Upload your design and choose your preferred size. With our fast printing turnaround, you can print bumper stickers and get them as soon as the next day. You might think that car decals have very limited space and it's not enough to use as a marketing opportunity. However, it all comes down to design. Here's how to make a bumper sticker that delivers the most impact. An elaborate design can take away from the message you want to convey. Whether it's simply your business name or your slogan, a simple design supports your core message. When it comes to stickers for your car, simple but catchy is the way to do it. Bumper Stickers is rated 4.8 out of 5 by 8. Rated 5 out of 5 by Churchlights from Quick and easy These guys are great. Product is what is described, shipped in a quick fashion. Happy with my multiple experiences with them. Happy to pay a slightly higher price for the great consistency with them.